Emory President James Wagner praises the diverse Class of 2014 for its 'joyfulness,' confidence and success. Emory Photo/Video. A sense of history and hope will infuse Emory’s 169th Commencement ceremony Monday, May 12, as civil rights icon and U.S. Congressman John Lewis (D-Ga.) delivers the keynote address during a year that marks the 50th anniversary of the Civil Rights Act of 1964. Lewis also will receive an honorary doctor of laws degree. Commencement starts at 8 a.m. and will take place on Emory's campus Quadrangle. About 15,000 people are expected to be in attendance. Emory President James Wagner will preside at the 90-minute ceremony for about 4,425 graduating students and their families. The Class of 2014 will participate in the pageantry of Commencement exercises that reflect centuries-old tradition, presented this year with a modern environmental twist: For the first time, 2,900 undergraduate graduation gowns and some professional doctoral gowns will be fashioned entirely out of recycled plastic bottles – the equivalent of 66,700 post-consumer plastic bottles that have been diverted from landfills – reflecting Emory’s role as a national leader in campus sustainability programs. Two other individuals will join Lewis this year as recipients of honorary degrees: Emory alumnus Ben F. Johnson III, former chairman of Emory’s Board of Trustees for 13 years, who will be awarded an honorary doctor of laws degree; and Beverly Daniel Tatum, the ninth president of Spelman College. 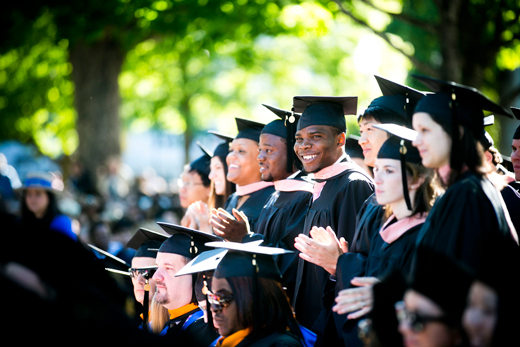 More at "Commencement to celebrate 'remarkable joy' of Class of 2014"
MEDIA ONLY: A detailed media advisory with logistics information for media representatives who plan to cover Emory's commencement will be sent Friday morning, May 9.